Do you know the Social Media Meta Tags and Open Graph Protocol can affect social media traffic? When you are sharing a url to social networks, they will find the social information which you defined between head tags, if it’s not available, they will get it’s in the post content. 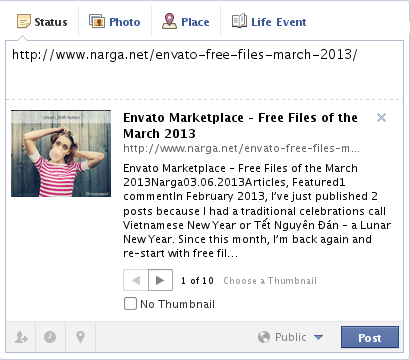 og:title – The title of your object as it should appear within the graph, e.g., “NARGA”. When creating your og:title keep the character count fewer than 95 characters. og:description – This is also similar to your html meta description tag, in which it should describe your content. og:url – The canonical URL of your object that will be used as its permanent ID in the graph, e.g., “https://www.narga.net/understanding-social-media-tags-open-graph-protocol/”. As the figure above, Facebook tries to read the code on your page, but they aren’t always able to pull your images. Facebook’s Open Graph protocol allows for web developers to turn their websites into Facebook “graph” objects. The information is set via custom META tags on the source page. fb:app_id – A Facebook Platform application ID that administers this page. If you have a fan page on Facebook and you want to get more data in Facebook Insights, then you have to use this tag. og:site_name – A human-readable name for your site, e.g., “NARGA”. summary: The default card, which includes a title, description, thumbnail image, and Twitter account attribution. photo: A Tweet sized photo card. twitter:card – This meta tag describes the type of content you are sharing. You have 3 options with Twitter: photo (for images), player (for videos), and summary (for everything else). If you don’t define your card, Twitter will default to summary. twitter:title – The title of your content as it should appear in the card. twitter:image – A URL to the image representing the content. twitter:site – @username for the website used in the card footer. twitter:site:id – Same as twitter:site, but the website’s Twitter user ID instead. Note that user ids never change, while @usernames can be changed by the user. twitter:creator – @username for the content creator / author. twitter:creator:id – Same as twitter:creator, but the Twitter user’s ID. After you apply the Twitter Card meta tags to your site, don’t forget apply to Twitter’s Card program. Once you get accepted, URLs from your website will be shown in the card format. I’m integrating Open Graph with an Android application I’m writing. However, in my case, the URL where the metadata are located is different than the og:url tag. In that case, Facebook tries to get the metadata from og:url instead of the primary URL I submit. Is there a way around it? The URL of the object, which acts as each object’s unique identifier, otherwise known as the canonical URL – each URL can only contain a single object – and in most cases this is the same URL as the page on which the property tags are placed. In short, I want Facebook to get the meta data from the Fetched URL and not the Canonical URL. I think this document will help you, it’s explaining about Facebook Property Types. Your comment include HTML code but it’s not between code tags, so I don’t know how to answer you. The problem is that Facebook decides to parse the metadata from the canonical URL (i.e. og:url) instead of the fetched one (the one I share). Let’s me see the real url of your example, when the page defined og:url as http://anotherdomain.com/fancystuff?id=100, Facebook will load it then skip another, to make FB load others, og:url must be blank or define to that one. “Understanding Social Media Meta Tags & Open Graph Protocol | NARGA” honestly got me personally simply addicted on your site!